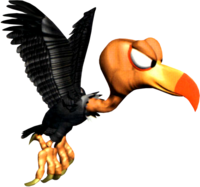 Mini-Neckies are small, black (sometimes blue) hostile birds encountered throughout the Donkey Kong franchise. As the name suggests, they are miniature versions of Neckies. The first appearance of Mini-Neckies is in Donkey Kong Country. In this game, they attack Donkey Kong and Diddy Kong by spitting coconuts at them. They later appear in the game's pseudo-sequel, Donkey Kong Land. Here, they have the same attack patterns as they did in the previous game, and still fire coconuts at the Kongs. Mini-Neckies next appear in Donkey Kong Country 2: Diddy's Kong Quest, where they are semi-common enemies encountered in various levels. In this game, Mini-Neckies attack Diddy Kong and Dixie Kong by swooping down at them, and can be defeated by being jumped upon. Unlike the vultures from Donkey Kong Country, these Mini-Neckies wear red polka-dotted bandannas on their heads, and are slightly larger. Donkey Kong Country 2 also introduces a giant Necky boss named Krow; and in the Kong's battle with the ghost of Krow ("Kreepy Krow") in Gloomy Gulch, several ghostly Mini-Neckies occasionally appear and attack the Kongs. During the battle against Kreepy Krow, the Kongs have to jump on a regular Mini-Necky to make a barrel appear, which they can then use to hit Kreepy Krow. Mini-Neckies, along with Krow, reprize their roles in the Game Boy pseudo-sequel, Donkey Kong Land 2. After a long absence, Mini-Neckies reappear in DK: King of Swing and its sequel DK: Jungle Climber, where they either swoop at the Kongs or shoot coconuts. Mini-Neckies also appear inside blue balloons as items in Donkey Kong Barrel Blast. They home in on the closest opponent behind the user and rams them, making them lose ten bananas. If they are used by a Kremling, the victim will also lose one Wild Move. Mini-Neckies appear in the following levels. In the "The Baddies" section of the credits from Donkey Kong Land 2, the Mini-Necky is mistakenly called Necky. This page was last edited on September 6, 2018, at 09:11.